Make a Home for Wildlife helps you see your property in new ways and is the resource you need to take the sometimes daunting steps to improve the quality of your land. According to U.S. Forest Service, 250 million acres of woods and forests in the United States are privately held by 10 million individuals/families. 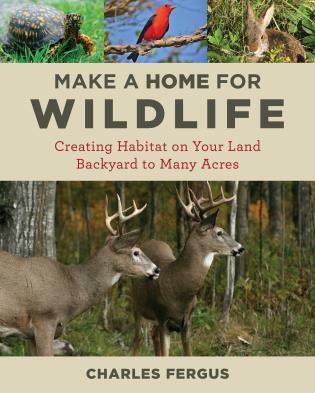 Whether you live on a quarter-acre lot in the suburbs, own a 20-acre woodland retreat, run a farm of 100 acres, or belong to an outdoor club with hundreds or thousands of acres, you can make changes to the land—improvements that will turn your property into a better home for wildlife. Habitat projects can be simple or complex, short-term or spanning decades. Cost can be minimal—a few hours of your time spent doing pleasant work in the outdoors—or can run into the hundreds or thousands of dollars. And there is funding to help landowners make wildlife habitat. Focusing on the eastern US from Canada to Florida and west to the Great Plains, this book describes basic habitat types—forest, shrublands, grasslands, and wetlands—and highlights over 150 select native and introduced trees, shrubs, and plants, explaining how they are used—or not—by wildlife. The book includes more than 100 profiles of prominent and interesting species of insects, reptiles, amphibians, birds, and mammals with information on animals and their habitat needs. Large and small mammals, resident and migratory birds, and insects are covered. Fergus relates stories of landowners who have made habitat in different states and regions in different ways.